BLUE ASH, Ohio -- Matthew 25: Ministries collects donations to send to people in need thousands of miles away. Sometimes they have items stacked from the floor to the ceiling, ready to be sorted. "It's wonderful," CEO Tim Mettey said. "Our volunteers make Matthew 25. Not only our volunteers, but the donors throughout Cincinnati make Matthew 25 what we are." Their Blue Ash warehouse is like a well-oiled machine. Donations come in, get sorted, and wait to get shipped out. According to Mettey, the organization sends more than 800 tractor-trailers loaded with donations to communities in need each year. The only downside to all that generosity? The organization is running out of room for all the donations it receives. "We need to expand," Mettey said. "Cincinnati has been so generous with their supplies." The organization is building a brand-new 35,000 square foot facility. The extra room means they'll be able to get the relief efforts out faster and will make the whole process more efficient. 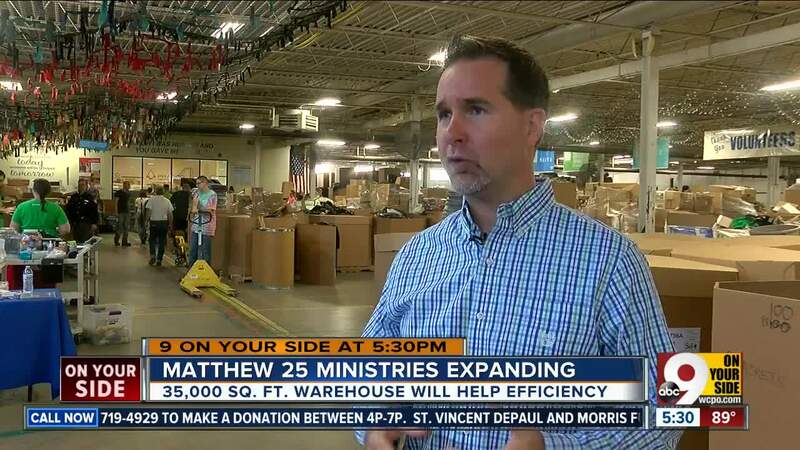 Alongside the warehouse expansion, Matthew 25: Ministries plans to expand offices and parking. Installing solar panels will make the facility more energy-efficient. The overall expansion is scheduled to be finished in two years. "(People) want us to reach out to them," Mettey said. "They want us to be the arm that reaches halfway across the world or into the backyard."